~X(); // represented by a CXXDestructorDecl. Definition at line 2713 of file DeclCXX.h. Definition at line 2761 of file DeclCXX.h. Definition at line 2762 of file DeclCXX.h. Definition at line 2480 of file DeclCXX.cpp. References clang::C, clang::DeclarationName::CXXDestructorName, clang::DeclarationNameInfo::getName(), and clang::DeclarationName::getNameKind(). Definition at line 2473 of file DeclCXX.cpp. Definition at line 2753 of file DeclCXX.h. Definition at line 2756 of file DeclCXX.h. Definition at line 2745 of file DeclCXX.h. 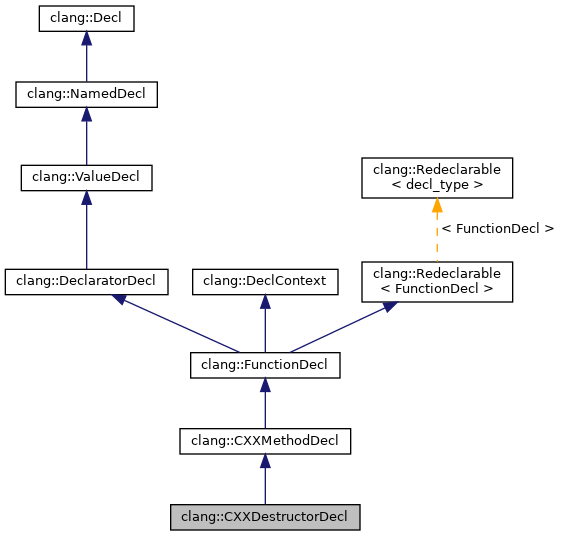 Referenced by clang::Sema::CheckDestructor(), clang::CodeGen::CodeGenFunction::emitImplicitAssignmentOperatorBody(), clang::CodeGen::CodeGenFunction::EnterDtorCleanups(), and clang::ASTDeclWriter::VisitCXXDestructorDecl(). Definition at line 2749 of file DeclCXX.h. Referenced by clang::CodeGen::CodeGenFunction::emitImplicitAssignmentOperatorBody(), and clang::ASTDeclWriter::VisitCXXDestructorDecl(). Definition at line 2492 of file DeclCXX.cpp. Definition at line 2714 of file DeclCXX.h. Definition at line 2715 of file DeclCXX.h.